TiVo’s Q2 2017 Video Trends Report lays bare the ongoing pay TV decline. However, it is not all doom-and-gloom for operators. The data reveals opportunities to bring more value if operators can move fast enough to capitalize on them. Leichtman Research says that major pay TV operators lost 1.2 million subscribers between Q2 2016 and Q2 2017. TiVo survey participants confirm the acceleration in cord-cutting. 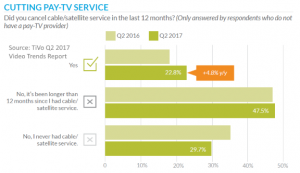 The number of people without pay TV that said they canceled the service within the past 12 months in Q2 2017 was 22.8%. In Q2 2016, 18% said the same. There are other signs in the TiVo data the cord-cutting is happening in earnest. People without pay TV are increasingly turning to an over-the-air antenna to deliver their live linear entertainment. 45.7% said they use an OTA antenna, up 12.4% over the last two years. Interestingly, there was a big uptick in pay TV subscribers saying they are happy with their service. 31.2% said they are very satisfied, an increase of 10% year-over-year (YoY.) Cost remains the hands-down top reason people are unsatisfied with the service, but this is 3.6% lower than last quarter. Perhaps there is a simple explanation as to why satisfaction increased and price dissatisfaction decreased. The population of unsatisfied pay TV customers decreased because more of them left. Moreover, those that left did so primarily because of cost. So, the number saying pay TV is too expensive fell too. 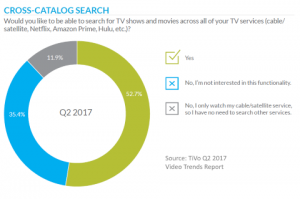 TiVo also asked survey participants if they would like to be able to search for content across all TV services they use. Such cross-service searches are becoming increasingly common on TV connected devices. 52.7% said they would like to do this, 35.4% said they were not interested, and 11.9% said they only watch pay TV and don’t need cross-service search. 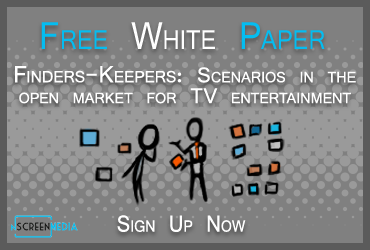 Aggregating OTT video services could be a great opportunity to bring extra value to Pay TV subscribers. One way to do that quickly is to embrace an open set-top box platform like Android TV. Judging by the crowds around the Google booth at IBC, many operators could be looking to do just that. With all these people leaving pay TV, there’s no prize for guessing where they are spending their time. Just under two-thirds of survey participants use monthly online subscription video services, about the same as in Q1 2017. Though subscriptions may have leveled off, overall usage continues to climb. TiVo reports 10.6% quarter-over-quarter growth in people saying they watch 2-4 hours of video per day on SVOD services. There was also a 6.9% increase in those saying they watched 4 or more hours a day. There was also a big drop in people watching 2 hours or less, down 16.3% QoQ and 18.3% YoY. People are spending more on subscription services too. 11% spend $25 a month or more for online subscriptions, up 3.3% YoY and 5.1% over two years. The increased spending could be due to two trends. Firstly, people could be subscribing to more SVOD services, which typically cost $10-$15 a month. Secondly, some people could be canceling their pay TV subscription and substituting a vMVPD service like Sling TV or PlayStation Vue, which typically cost $20-$40 a month. 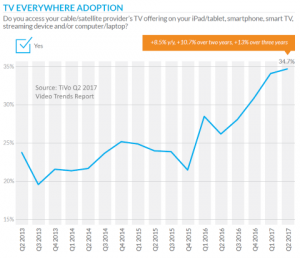 One definitively positive note for pay TV operators is that TV Everywhere (TVE) services do seem to be taking hold with customers. 34.7% of pay TV subscribers said they accessed their operators content on their connected device in Q2 2017, an increase of 8.5% YoY. What’s more, 26.1% of those TVE users say they use it on a daily basis. In other words, 9% of pay TV subscribers have incorporated operator portals into their daily lives. Was the investment in TVE worth it for operators, since it does not seem to be stopping cord-cutting? However, it could be contributing to the increase in customer satisfaction. Moreover, that, ultimately, could make subscribers think twice about leaving. Pay TV operators are losing subscribers faster in the U.S. Operators have an opportunity to stem the losses by aggregating online video services for their customers. They should do this quickly as their consumers are spending more time away from pay TV and with SVOD. TV Everywhere seems to be finally paying off for operators, though it is not slowing the decline in subscribers.